Jacob William, true to his name, is a dreamer, visionary and a strategist. He would do whatever it takes to translate his dreams into a reality. 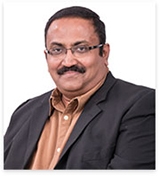 He has over 25 years of Industry experience in transforming strategy into operational excellence. He has this unique ability to attract the best talent, and engage with them to create global leadership teams which drive the global Flatworld dream. He is very hands on and engages with employees at all levels, and empowers them to maximize their capability. Jacob has the ability to look at the Technology, Mobility, Big Data, Cloud Computing, Analytics and Visualization landscape and stich them together to provide practical solutions that bring value to keep Flatworld in the bleeding edge of the Big Data Revolution, moving into the 21st century. He speaks multiple languages and enjoys global cuisine, (he is an ardent foodie). He loves travel and adventure. David Antony has been in the IT and ITES industry for over 24 years. He graduated with a degree in Electronics and a post graduate degree in Business Administration. 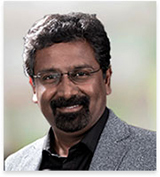 Prior to Flatworld, he worked in a senior management capacity with leading Software Development, IT training and consultancy firms across India and the Middle East. He has been responsible for setting up and running offices and delivery centers across India, Philippines and South America. A people person, he inspires and nurtures people to achieve their full potential. An idealist and a tenacious individual, he believes in getting the job done and lives by his personal motto "The difficult can be done, the impossible takes a little longer". He is known for his intense curiosity and desire to learn, and has a wide range of interests. Always ready for the next challenge, David has been responsible for establishing and growing several service lines within Flatworld. Anand Mathew comes with 15 years of experience in the Marketing and Advertising industry, plus a decade long expertise in the ITES sector. A mechanical engineer, he has served in senior management capacities in Advertising Agencies and Marketing consultancies in India and the Middle East. He has functioned in Strategic roles in building brands and has worked across domains from Automobile and FMCG to IT and ITES segments. Anand specializes in building service lines on a 3600 plan, managing stakeholders across domains as varied as Design and Development, Engineering services, Research & Data services, and Video & Animation. 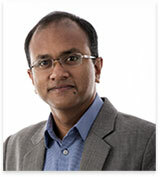 Anand is an 'Ideas specialist' and can envision solutions rapidly. A quick learner, Anand over the last 8 years moved seamlessly to lead Finance, Operations and Sales Management, from Managing Brands and Campaigns as a Creative Director earlier. A people person and an avid political analyst, Anand focuses on social projects across India. He believes that 'giving' is as important as 'earning'. Anand loves tennis; he is also passionate about martial arts and is an ardent fan and practitioner of Krav Maga. Seby Kallarakkal personifies our commitment to using cutting-edge technology to offer high-quality services enhancing customer satisfaction. With an experience of over 19 years, Seby has brought tremendous innovation and efficiency in maximizing the performance of Flatworld's technology team and platforms. During his tenure, he has also helped in defining Flatworld's marketing vision by applying a data-driven approach to collecting, integrating and analyzing marketing data, and leveraging it to improve customer acquisition and retention. 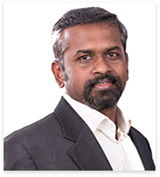 Seby holds an Engineering Degree from IIT Kharagpur and an MS in Software Systems from BITS Pilani. He has vast experience in a variety of industries such as Architecture, GIS, Internet Marketing, Software Development, e-commerce, Analytics, and Big Data. 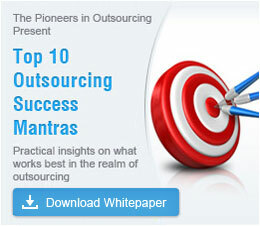 He is also the founder and CEO of Nabler Web Solution Pvt. Ltd., one of the earliest pure-play digital analytics companies established in 2004.